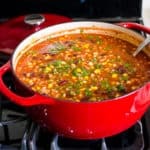 Turkey Taco Soup Recipe made healthy with ground turkey, pantry ingredients, on a stovetop or in slow cooker. Either way it’s hearty and delicious! Stovetop Method: Preheat large dutch oven or heavy bottom pot on medium – high heat, swirl a bit of oil to coat, and add turkey. Cook for 5 – 7 minutes, stirring occasionally and breaking into pieces. Add taco seasoning and cook for 1 more minute, stirring frequently. Add tomato sauce, beans, corn, onion powder, maple syrup, salt, pepper, water; and stir. Cover, bring to a boil, reduce heat to low and simmer for 30-60 minutes (longer – deeper flavours but overall soup is ready fast). Add cilantro and stir; serve hot with tortilla chips and Greek yogurt (if desired). Slow Cooker Method: Preheat large ceramic non-stick skillet on medium – high heat, swirl a bit of oil to coat, and add turkey. Cook for 5 – 7 minutes, stirring occasionally and breaking into pieces. Add taco seasoning and cook for 1 more minute, stirring frequently. Transfer to a large slow cooker along with tomato sauce, beans, corn, onion powder, maple syrup, salt, pepper, water; and stir. Cover and cook on Low for 7 – 8 hours or on High for 3 – 4 hours. Make Ahead (Slow Cooker) for Freezer: In a large Ziploc bag, add cooked ground turkey (let it cool first) along with all ingredients (except water, cilantro and garnishes). Let air as much as possible, seal and freeze for up to 3 months. Thaw in the fridge overnight, add to slow cooker along with water, and cook as per further instructions + 1 hour. *You might need to use less salt if using regular (not low sodium) tomato sauce.